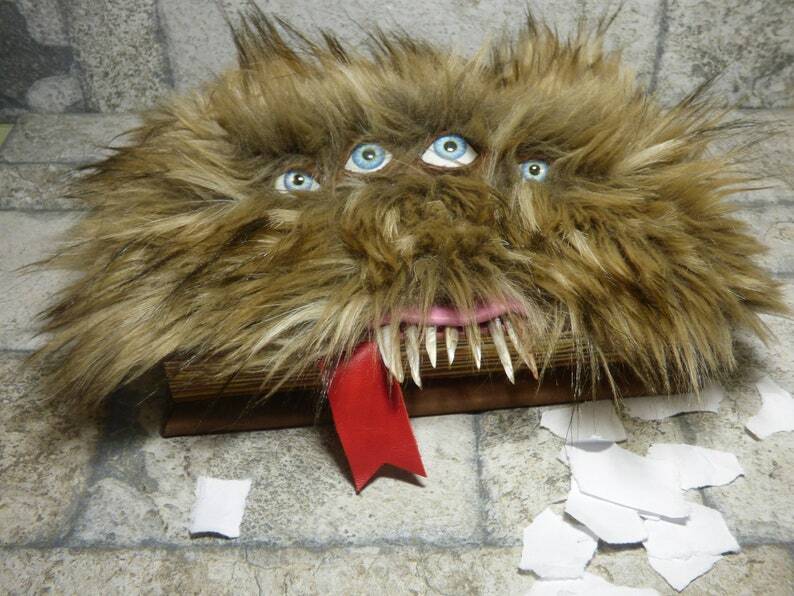 This wooden book box has been covered with premium leather and luxury faux fur with handmade eyes and teeth. The "spine" of the "book" pulls out to reveal a secret drawer perfect for hiding the treasures you collect in any world. Along the outside edges you can see the "pages" of this monster book. The drawer inside has been hand painted and the bottom covered with a "monster" page from the "book". It is 6 1/2 inches (165.1 mm) across the front x 8 1/2 inches (215.9 mm) top to bottom x 1 3/4 inches (44.45 mm) thick. All my One of Kind original pieces are signed by...me, Pippenwyck!!! I hope you like this creature!! There are many interesting things here so come visit often! You never know what you might find...or what might find YOU!! This is a Sneaky Book Box creature found hiding in the library pretending to be a book. There was the curious sound of paper being torn, hysterical giggles and the terrified cries of books coming from my home office/library. Sneaking up the stairs I peered through the door crack only to see this wicked creature ripping my books to pieces!!! Books squealing in terror, words babbling incoherently while pages flew through the air in a desperate attempt to get away!!! Oh Dear, Oh Dear, Oh Dear!!! Quickly I cast a powerful enchantment to stop the carnage and mayhem enchanting this wicked creature into a book box, a sneaky book box!!! Now, this creature will guard your treasures inside the secret drawer and should a sneak thief attempt to peer within...Well, he does have teeth and knows how to use them! Have you need of a sneaky book box for your treasures? ?